BBC pundit Don Hutchison has told Oliver Burke to stay at Celtic for as long as he can to further develop his talents as a top striker, speaking on Radio 5 Live. The £9m-rated forward (Transfermarkt) has made quite the impact at the Hoops since joining from West Bromwich Albion on loan in January, scoring four goals and assisting once. That immediate burst of form may have gone off the boil slightly in recent matches, but there’s no doubt he has the attributes to be a success in the Scottish Premiership and former Scotland international Hutchison believes his development is best served by joining the Hoops this summer after his current loan deal expires at the end of the season. There’s no need for Oli Burke to move away from Celtic because at the present time, the form he has been in, not amazing form but y’know, better form from where he was a year ago. He probably wouldn’t get in most Premier League sides at the moment, not starting anyway. So this is no disrespect to Celtic but it’s a great place for Ollie Burke to try and improve, play well, and have an atmosphere and a crowd that are going to drive him on and a manager in Neil Lennon, or whoever it may be in the summer, that will drive him on to the next level. If I was giving Ollie Burke advice, I’d say stay at Celtic as long as you can as that is the place for you to learn your trade and get yourself to a high level. Whether Celtic have the resources to make a move for him at the end of the season remains to be seen. West Brom did shell out for him to sign the player from RB Leipzig. The player is clearly enjoying life in Glasgow and is playing with renewed confidence, so ultimately the pull of Celtic Park could influence him into pushing for a move. 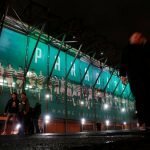 With lots of rebuilding to do this summer though, the recruitment team at Celtic could be tempted to divert resources to other positions in the first-team.